Washington Nationals Daniel Murphy won the Silver Slugger Award for National League second basemen on Thursday night, marking his second consecutive season winning the award. 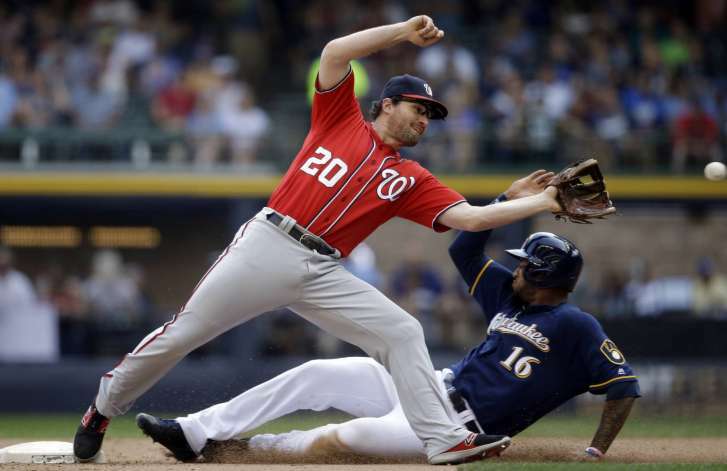 WASHINGTON — Washington Nationals’ Daniel Murphy won the Silver Slugger Award for National League second basemen on Thursday night, marking his second consecutive season winning the award. The 32-year-old was the best-hitting player in his position. He led all National League second basemen in doubles with 43, and was the best hitter in Major League Baseball with runners in scoring position, batting .409. Murphy said he was honored to humbled to receive the award, which Louisville Slugger announced on MLB Network Thursday night. “I am extremely proud to be considered among this group of talented players. To be recognized by opposing coaches and managers for the way I play the game is quite a compliment and I’d like to thank my teammates, coaches, medical staff, and support staff for their assistance in helping me achieve this award,” he said. Murphy won the first Silver Slugger Award of his career in 2016. His win marks six consecutive seasons that the Nats have had at least one winner of the Silver Slugger Award. The team has won 13 total awards.